I have been into fitness in one form or another for most of my life. When I was younger I was into dancing and horseback riding for years. Through my teens and early twenties I was a runner. My dad and I would run 3 to 5 miles almost every night. I then got into the whole Gold’s Gym scene. I lived in the gym, 5 or 6 days a week. I was in there for about 90 minutes for a workout. I would plant myself on a piece of cardio equipment for about an hour, and then do some abs or other misc body part. Pat and his friends did CrossFit in the garage. I would walk through their workouts to get into my car and go to Gold’s Gym. It looked different, intense, and most of all,..not boring. They were constantly doing something different. It looked fun so I started doing 1 CrossFit workout a week along with my Gold’s gym routine on the other days. Then I did 2 CrossFit workouts each week, then 3, then 4, and so it went until I canceled my Gold’s Gym membership. It was the best thing I have ever done for my fitness. Fitness has been a part of my life as long as I can remember. I’ve been lucky that my parents were always pushing me to get off the couch and stay active. Martial arts, surfing, kayaking, bodysurfing, weightlifting, yoga, anything that involves movement I’ll pretty much try it. Probably the largest influence was my time spent in the gym with my Mom. When I was really young she was big time into running and then when I was about 10 or 11 she started to train for bodybuilding competitions at Flex Gym in Virginia Beach. I was in the gym with her all the time, and as soon as I was old enough I started to lift weights myself. It was an awesome experience to be there so much, the gym was always filled with amateur and professional athletes of all sorts. Being naturally curious, I relentlessly pursued the poor trainers there with barrages of questions constantly picking their brains. I trained on and off in the old school body building style throughout my late teens and early twenties. Despite gaining muscle size pretty easily, I would get really bored with the training. I needed something more. In massage school I got exposed to a whole new gamut of movement styles like I had never seen. A lot more functional, multi joint movements. I dabbled in yoga, Feldenkrais method, and even the Core Essentials stuff by Mark Verstegen for awhile. All fun stuff, but something was still missing. I couldn’t really put my finger on it though. Until the day I found CrossFit. I saw the web address in an article in Real Fighter Magazine. My first minute on the website I was hooked. I finally found the two things I had been missing all this time, variety and intensity! I immediately started trying to integrate some of the movements into my workouts. Wake up call big time! 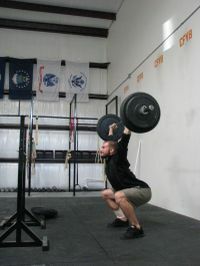 I followed the site and played with the movements for about a year when CrossFit VB opened. After one workout I knew I would never go back to my old way of doing things. CrossFit has helped me to become the healthiest I’ve ever been in my life, and I still have lots of room to grow.